Every year, the coming of spring brings with it a reawakened sense of life. The sun shines longer each day, native wildlife comes out of their winter hiding places, and deciduous forests begin to turn green again. Spring is far from just flowers and sunshine, though. Rising temperatures and quick, powerful air pressure changes make conditions ripe for wild weather. In the United States’ vast river valleys and areas near large bodies of water, flash flooding is a constant springtime threat. Outdoor enthusiasts must accordingly be able to handle flash flooding, as they’re among the most likely to be in rising water’s path. 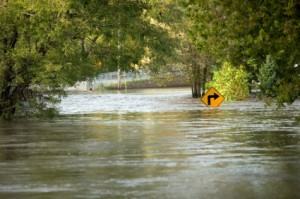 The biggest cause of flooding in low-lying areas usually isn’t localized precipitation. It is in fact watersheds from upstream portions of rivers. This precipitation accumulates into the river channel, making swaths of land downstream vulnerable to rising water. Flash flooding might seem gradual, but it often happens surprisingly fast – especially in smaller streams and brooks. If you happen to be on a hike or campsite near any running water, there are a few basic steps to take immediately. The number one concern in any situation should be getting to higher ground. If the water is noticeably rising, don’t bother with prolonged attempts to gather gear and supplies. Get everyone together, and get on the move on foot or in your vehicle. In most cases, just getting out of the river bottom or creek ravine is enough to keep you and your loved ones safe. When driving in high water, special consideration must be taken. Statistics show that a high number of drowning cases involve motor vehicles – mostly because people attempt maneuvers they simply can’t make. The general rule of thumb is if the road is covered in water, turn around. Judging water depth from the driver’s seat is too difficult and too risky to attempt. After the water recedes, hidden dangers might still lurk in previously flooded areas. Debris is typically the biggest risk. Exposed nails and shattered glass is covered in bacteria, which easily leads to cuts and infections. Additionally, you should keep an eye out for downed power lines, or anything that might carry an electrical charge for that matter. This is particularly true if your home or weekend-getaway cabin has been flooded. All told, responding to a flash flood is in essence a matter of common sense. Like most other emergency situations, your first priority should be getting yourself and your loved ones to safety. As frazzling as an experience with flash flooding can be, quick, rational response and a precautionary attitude in its aftermath are your best measures for security.